LAS VEGAS, Sept. 12, 2017 /PRNewswire-USNewswire/ -- VIVA Physicians, a not-for-profit organization dedicated to advancing the field of vascular medicine and intervention through education and research, announced the first five of 20 highly anticipated late-breaking clinical trial results on Tuesday morning at VIVA 17, hosted at the Wynn Las Vegas. Presented by Michael Dake, M.D. In the SENTRY trial, 129 patients requiring temporary PE protection were enrolled across 23 sites. The rate of new symptomatic PE through 12 months was 0 percent (0/129). There were no instances of filter tilting, migration, embolization, fracture, IVC perforation through 12 months or device-related deaths. The rate of successful Sentry bioconversion was 95.7 percent at six months and 96.4 percent at 12 months, an improvement over published retrieval rates. Presented by Thomas Zeller, M.D. IN.PACT Global is a multicenter, international, prospective, single-arm study designed to expand on clinical evidence with the In.Pact Admiral drug-coated balloon (DCB) (Medtronic) for the treatment of real-world patients with symptomatic femoropopliteal disease. To date, IN.PACT Global is the largest independently adjudicated DCB study of real-world patients with femoropopliteal artery disease. Two-year results demonstrate consistent and durable clinical performance, and confirm the positive results observed in the IN.PACT SFA randomized trial. The first 900 patients in Japan treated with drug-eluting stents were enrolled in the Zilver PTX study. Nine hundred and five patients with 1,080 lesions were enrolled at 95 institutions. Comorbidities included a high incidence of chronic kidney disease (44 percent) and critical limb ischemia (21 percent). The current study continues to show positive outcomes through four years. For the challenging subgroups evaluated, results were similar and favorable through two years, indicating that the Zilver PTX DES may be a valid treatment option for patients with these difficult-to-treat lesions. The BioMimics 3D helical stent (Veryan Medical, Ltd.) has a 3D helical centerline designed to impart nonplanar curvature to the vessel, promoting swirling blood flow. The study randomized 76 patients with symptomatic peripheral artery disease 2:1 to either BioMimics 3D or LifeStent (Bard Peripheral Vascular). A statistically significant difference was observed in primary patency through 24 months. These data support the BioMimics 3D helical stent in primary stenting of complex lesions and point to potential for complementary use with DCBs. Presented by Peter Schneider, M.D. IN.PACT SFA enrolled 331 patients with symptomatic femoropopliteal lesions. Four-year results of the IN.PACT SFA trial demonstrated sustained treatment effect in maintaining significantly higher freedom from CD-TLR by KM estimate in patients treated with the In.Pact Admiral DCB compared to PTA despite a late catch-up effect. Among patients requiring reintervention, the mean time to the first event was significantly longer in the DCB group. VIVA Physicians, a not-for-profit organization dedicated to advancing the field of vascular medicine and intervention through education and research, strives to be the premier educator in the field. Our team of specialists in vascular medicine, interventional cardiology, interventional radiology and vascular surgery is driven by the passion to advance the field for optimal patient care. 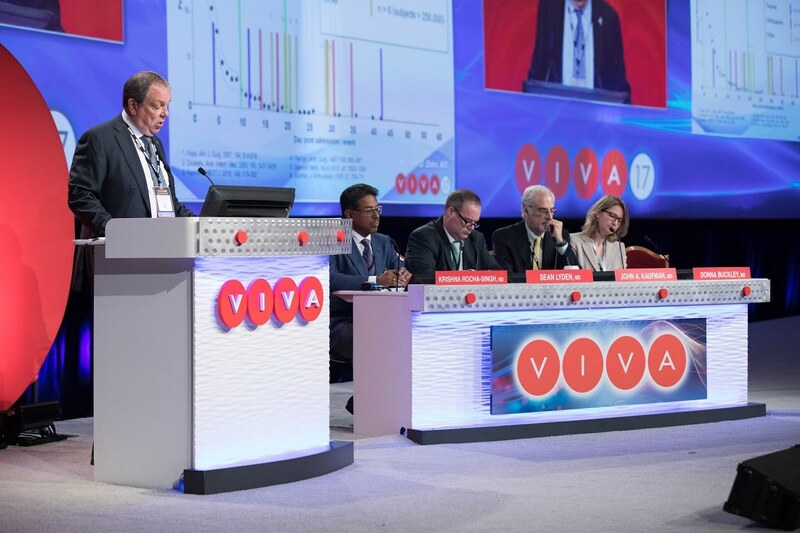 Educational events presented by VIVA Physicians have a distinct spirit of collegiality attained by synergizing collective talents to promote awareness and innovative therapeutic options for vascular disease worldwide. To learn more about VIVA Physicians, visit www.vivaphysicians.org.